Billie Joan Adkins, 87, a former resident of Portsmouth, Ohio, went to be with her Lord and Savior, Nov. 30, 2018 at her daughter’s residence. 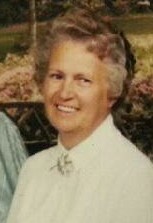 She was born in Letitia, Kentucky, Sept. 11, 1931, a daughter of the late Ora Lyons and Pearl Stone Lyons. She was an Evangelist-Pastor, former grocery store owner and a member of Adkins Family Singers. Preceded in death by her Husband/Sweetheart, Edward Adkins, April 8, 2010, one brother, Glenn Roy Lyons, two sisters, Delcie Mae Lyons, Mandy Ellen Lyons, one great-grandson, Gerald Haines, one great-granddaughter, Aleanna Tamaris Lore-Prado. Surviving are one son, Michael (Debbie) Adkins of Portsmouth, Ohio, three daughters, Gloria (David) Blevins of Grove City, Ohio, Darlene Lore of Portsmouth, Ohio and Kathy (David) Salyer of Beaver, Ohio, six brothers, David Lyons, Truman Lyons, Tony Lyons, Frank Lyons and Jesse Lyons all of South Shore, KY, and Mark Lyons of Ingleside,Texas, one sister, Mary Potter of South Shore, KY, thirteen grandchildren, fifteen great-grandchildren and two great-great-grandchildren. Funeral services will be held 1 P.M. Tuesday, Dec. 4, 2018, at the Roberson Funeral Home in South Shore, KY with Rev. Jeffrey Lambert and Rev. Gary Newman, officiating. Burial will follow in Lyons Cemetery, South Shore, KY. Friends may call at the Funeral Home from 6 till 8 P.M. on Monday, Dec. 3, 2018 and one hour before the service time on Tuesday.